Every year beginning in 1988 six foodie friends got together for a weekend in The Hamptons and cooked their little foodie hearts out! It was called the Dewey Lane Eating Club (DLEC) – after the location of the first event. Adrienne was the architect of the menu and the head chef but everyone participated in the preparation and cooking of the food. Except for her husband who brought the wine. Over the years the venue changed but the name of the club stuck. I was invited to join the group in 2007. That year it morphed into the Piggy Weekend because of a fabulous roast suckling pig we slow cooked on the BBQ and devoured. Subsequently the regular members were assigned or acquired piggy related monikers. 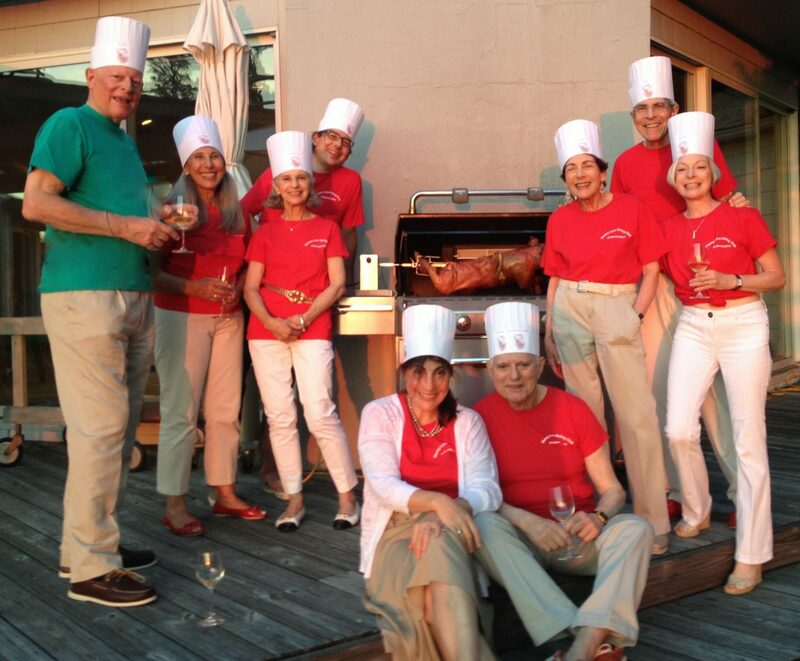 In the picture here from the August 2013 weekend when we reprised the Piggy menu, we are from left to right: Michael – Pig Latin, our hostess Lisa – Miss Piggy, Sharon – Free Range Piggy, Christopher – procurer of the pig and master grillman, Allison – daughter of our hosts and wife of the grillman, Martin – Not a Pig, Adrienne – Pig Pen, our host Dan – Piguin (inside joke!) and me – Pastry Pig. We were ten little piggies if you count the pig!